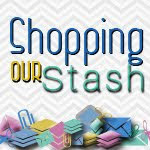 I am tackling the Ellen Hutson June Pin-Sights challenge. I was inspired by that cake with the gold accents, that watercolor wash and the lovely blooms in yellow, pink and orange. This morning I layed down some pink, yellow, orange and gold watercolor on a panel of water color paper. I then let it dry on it's own and took a nap. Returning, I then cut several pieces from the EH Wild Garden die set and set about arranging the pieces. The sentiment is also from Ellen. After several tries and several different card base options, this was my favorite so I glued it down. The challenge runs until July 4, 2017. I am entering this card to Less is More...though my little embellishments might have taken me out of the CAS realm. There is still a lot of white space though. 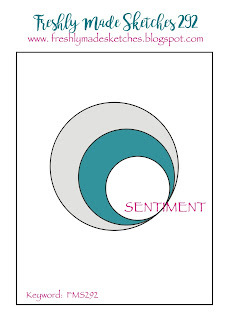 Since my die had a sentiment, I didn't add anymore to the underside of the curve. Or we could pretend I took the sketch and turned it upside down and inside out. The inside panel is inked with distress oxide ink in worn lipstick. It is a fabulous pink. Hi there! Hubs and I are just back from a quick and unexpected trip to Ohio. It was a whirlwind of activity. Since it was unplanned we had just a few short days with family. I had several of the last posts scheduled to go up while we were gone. After unpacking and getting the laundry under control, I decided that my neat stacks of boxes and risers under my work and crafting tables just looked bad. Once an idea to clean something up or to reorganize takes hold...nothing else can be done until the job is finished. You guessed it, it's finished now and I can play again. That's enough catching up with me. 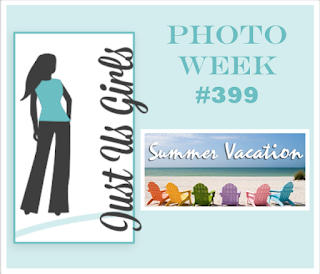 Today I am getting in under the wire with the Just us Girls photo challenge. My inspiration came from those Adirondack chairs - they scream relaxation to me and the word summer. For those not near the coasts and beaches a day at the lake is a perfect summer pastime. Stamps from CTMH, Colored with Copic markers. Another birthday card... but without the sentiment on the front I couldn't find the right one. Another shot at this chrysanthemum Peggy stamped it for me. The color spaces are a bit thin for my level of coloring skill, but I like the result. Coloring has to be my favorite medium for card making, and I have a respectable collection of copics. I thought I would share some of my copic tidbits. I used to have them in the half wide deep art bin with the marker inserts but I out grew that and having a second bin made no sense to me. I kept the bin, and took out the inserts. I put the original dividers back in so there are 4 sections. I bought cheap tulle bags (about a dime each) and put each color family in a bag. I fold the edges down when they are in the bin, and I can pull the edges up and tie them closed if I just want to take a particular group or collection with me to a crafty meet. This holds a lot of markers, I have about 175 or so, and I still have room to add. Now my collection of refills is much smaller, I am buying them as I figure out my go to color combinations. For now they reside in a Container Store lidded storage bin. To figure out my favorite color combinations, I made up a sheet of ovals and rectangles to show the colors I use for each coloring I complete. My list is growing. The ones I go back to over and over will give me the list of refills I'll need to buy. I store them in the 2x2 inch coin protectors ala Jennifer McGuire's various swatches. I like that I have each of the colors individually and a sample of the blend. I made these sheets up in word and then printed these with my HP Inkjet printer on spectrum noir paper. I let them "cure" overnight; and no smearing of the printer ink. Thanks so much for sticking through this long post. I decided to take a few of the colors out for a run on some note cards. Thanks much for stopping by~! 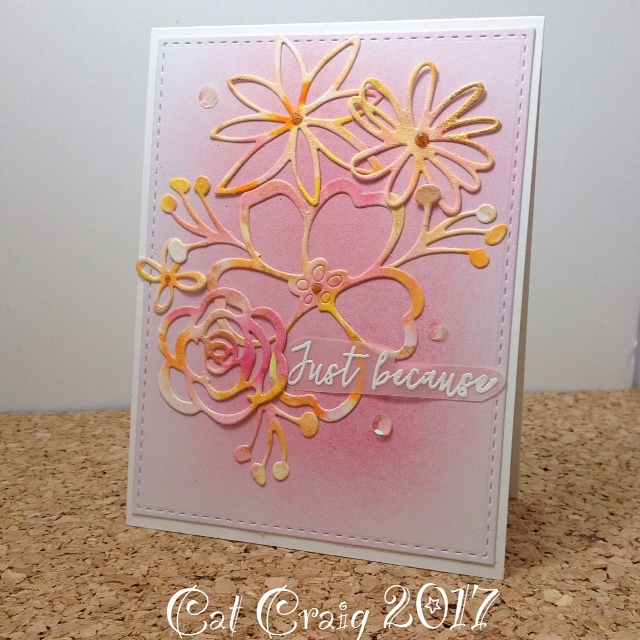 Another flower card with fabric, this time I added some envelope liner in LF Doe ink to the card base to give it some texture. I cut several of each of the flowers so I could layer them up. I am quite pleased with the result. Hi There~ It has been another short night and some more coloring. I loved the sketch at Freshly Made Sketches, and I have had the idea in my head since I saw the sketch...finding the right image slowed me down. As soon as I saw this sketch, I knew I wanted to do an inlay but with multi layers, showing the middle circle as flat and with darker hues of color than the two outer rings which would be raised from the card surface. Stamps used are Teeny Tiny Wishes and Best Thoughts both by Stampin Up. I used some favorite copic colors and just added one darker marked for the flat layer of the bloom. 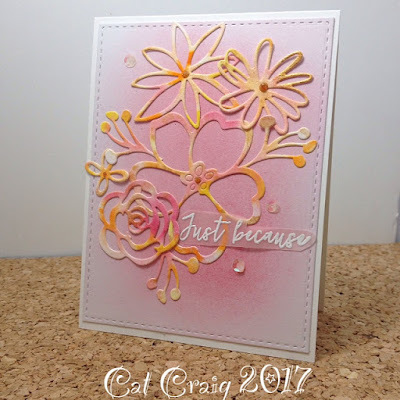 The sentiment was added using a layer of pink vellum. To both the fathers; I am one of the lucky gals who has stellar men in her life. Both my Dad and Father-in-law dabble in golf. I thought this lil pop up box card would be fun for them. The Lawn Fawn die makes creating the box structure easy. 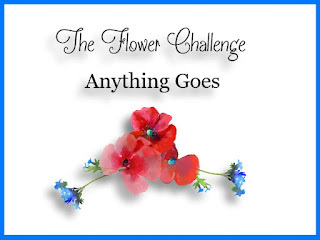 I am playing along with the ninth Flower Challenge which has a theme of anything goes. I was hanging out with the crafty gals and playing with copic markers. For the heck of it I combined blue greens and blue violet colors. It was just a testing panel, but one of the gals was really taken with the colors. So I made the panel into a card. I had to cut it out as the panel also had my color scribbles on it. I think it turned out nicely, and I am sending it off to her in the mail as a thank you for her encouragement. As I was trolling through blogland this morning I found out there was a scramble over at the Hero Arts group page on Flickr. So I hopped over and found the scramble was for 24 hours, and participants could pick any 90 minute period to make their cards. Karen's theme was: Make it Masculine, Decorate the Envelope, and Any size other than A2. Of course Hero Arts Products should be the focus of the card as well. Masculine cards, can be quick or horrifyingly difficult. I went with quick after all it was a scramble. So in 64 minutes this is what I came up with. I went for a square card, so I inked up the Hero Arts Hexagon background with HA Navy ink and laid paper to stamp, I covered it with copy paper and rubbed it all about to get good ink transfer. My card panel was A2 sized but I cut it down to 4x5 inches. Next I took a 5.5 by 8.5 inch card base and trimmed it to be 5 x 8.5 with a score line at 3.5 inches from an end to make a top folding card base. I overlapped my stamped piece on to the 3.5 inch side so that it overlapped quite a bit and left a 1 inch border at the top of the card that was white. Next I inked up some paper, white heat embossed the birthday greeting and cut it to look like a tab and added it to the card front. No embellishments...its a guy card...but I do have some navy sequins which might be added later...still thinking about it. Now for the envelope....I made my own and stamped the hexagons on it to cover the back flap and about an inch or so down the envelope front. The edge ended abruptly on the stamp, so I added a 1/4 inch line with a B99 copic marker. I am happy with the set and it's great to have a guy card in the stash. I make make a few more of these in A2 size in green and gray. Hero Arts scrambles can be found in the Hero Arts Discussion Group on flickr. I found some time to get in a bit of copic coloring this week. 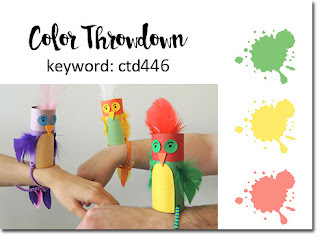 I am entering this to Color Throwdown 446, colors to use are yellow, coral, and green. I did sneak a bit of lavender in too I think that third bird got in my head as I was creating...so I am taking some artistic license and calling it a neutral. Hi There... we are having a few cool days here in Maryland before the heat smacks us again over the weekend. I spent some more time with the AI Watercolor Stamps, this one borrowed from Peggy. I thought it made a fabulous masculine card. I am entering the card to both SOS - Dude and SSS Wednesday Challenge - Make it Masculine. Hello- June can you believe it is June already? Yikes where had the year gone? For the May Card Chain Challenge, my card is going to Canada. I chose to work with the colors of pink, gray and blue. It's a simple card but with lots of texture. One paper is tone on tone polka dots, one paper is glittered, my card base is dry embossed, and the sentiment is heat embossed. I am really pleased with this card.